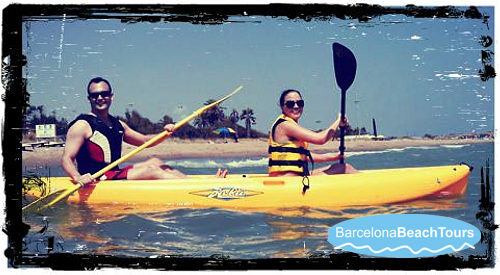 Barcelona beach tours to Gava Mar beach include the possibility of sailing fun family kayaks called Hobie Quest kayak. Hobie Quest kayaks are built for fun and safe kayak sailing and are very stable and easy to use. A	Hobie	kayak	can carry two adults. or one adult and two children. The kayak weighs just 30 kilo and the hull is made of rotomolded polyethylene, which is basically a strong plastic construction. Hobie kayaks are very stable and built to be unsinkable, so you can quite easily jump off the the kayak and climb back on board again. But we recommend that you make a test climb in shallow water before leaving the kayak in deeper waters. Paddling on calm seas you will be surprised at how quickly you can cover distance with little effort. But be sure to check the current wind and current conditions, as that might be helping you along. It is generally a good idea to start by paddling against the wind. At Gava Mar you often have the south-west Garbi wind – and as the beach faces almost due south, it is a good idea to start by paddling into the wind towards Castelldelfels in a Garbi wind. That way the wind will help push you back when your rental time is over and it is time to paddle in. If there are some waves you can finish your kayak tour by trying some kayak surfing which means surfing on the waves with the kayak. This should only be done within the sailing channel which is clearly marked by yellow buoys. If you sit just outside where the waves are breaking and wait for a large wave, you can quite easily ride the wave by starting to paddle quickly just before the wave reaches you. The person at the back should use his or her paddle as a rudder to keep the kayak straight and make sure the kayak stays on course while you surf the wave. After a few tries most people quickly learn the art of kayak surfing. Kayak surfing with small children is not advised if you have not tried it before. And don’t be surprised if you capsize a few times learning to catch the waves.